Eyes with retinoblastoma and total retinal detachment at initial presentation have been previously considered not salvageable and commonly managed with enucleation.1 Recent advances in retinoblastoma management with the use of intra-arterial chemotherapy, with or without intravitreal chemotherapy, now result in complete resolution of total retinal detachment in 43% to 54% of cases, with up to a 73% chance for globe salvage in selected eyes classified as group E retinoblastoma.2–4 However, the presence of long-standing retinal detachment can cause retinal ischemia with release of vascular endothelial growth factor (VEGF), leading to neovascularization of the retina, optic disc, and iris. Typically, retinal neovascularization is treated with anti-VEGF injections, although the use of anti-VEGF therapy has been less well studied in retinoblastoma, and injections are typically avoided in the setting of retinal detachment or active tumor.5 Resolution of underlying pathology can lead to improvement of retinal neovascularization, resulting in downregulation of VEGF, even in the absence of specific anti-VEGF therapy. We present a case of spontaneous regression of florid retinal neovascularization following resolution of traction retinal detachment in an eye with treated retinoblastoma. A 19-month-old boy was referred to the Ocular Oncology Service at Wills Eye Hospital, Thomas Jefferson University for leukocoria in the left eye. The child was born full-term by cesarean section. There was no family history of ocular cancer or blindness. On initial examination, visual acuity was fix and follow in the right eye and no fix or follow in the left eye. Intraocular pressures were normal in both eyes. The right eye was normal anteriorly and funduscopically. The left eye demonstrated 10 prism diopters of esotropia, leukocoria, and total retinal detachment against the back of the lens with a deep subretinal exophytic retinoblastoma, measuring 20 mm in largest basal diameter and 16 mm in thickness (Figure 1A). Subretinal blood and extensive subretinal seeds were present, but there were no vitreous seeds. B-scan ultrasonography confirmed the presence of a calcified mass temporal to the optic disc (Figure 1B). Magnetic resonance imaging showed no evidence of optic nerve invasion or extra-scleral extension. The patient was diagnosed as having advanced unilateral group E retinoblastoma with possible retinal and iris neovascularization in the left eye. For insurance reasons, fluorescein angiography was not performed at the initial visit. Genetic testing was positive for germline RB1 mutation. Group E unilateral retinoblastoma treated with intra-arterial chemotherapy (IAC). (A) A 19-month-old boy treated with IAC for group E retinoblastoma initially presented with total retinal detachment and retinal neovascularization. (B) Ultrasonography confirmed a tumor size of 20 mm in basal diameter and 16 mm in thickness with intralesional calcification. (C) Tumor regression occurred after one cycle of IAC, with (D) ultrasonography demonstrating decreased tumor thickness to 6 mm and improvement in subretinal fluid. The patient was advised to have treatment with enucleation or intra-arterial chemotherapy. Intra-arterial chemotherapy was preferred, so melphalan 5 mg and topotecan 1 mg were delivered for four cycles. After the first cycle of intra-arterial chemotherapy, the patient was seen at two outside hospitals for insurance reasons and found to have iris neovascularization and ectropion uveae with a shallow anterior chamber, heavily calcified regressed retinoblastoma, and persistent total retinal detachment in the left eye. The patient subsequently received one cycle of intravenous vincristine, etoposide, and carboplatin elsewhere. Two months after initial presentation, insurance issues resolved and the patient returned for treatment at Wills Eye Hospital. At that time, the tumor demonstrated regression and calcification with a decrease in subretinal fluid on ultrasonography (Figures 1C–1D). Fluorescein angiography revealed patchy ischemia of the iris with old iris neovascularization at the 2-o'clock position and a hazy view posteriorly due to vitreous hemorrhage with presumed neovascularization elsewhere. The patient went on to complete intra-arterial chemotherapy cycles two through four. Three months after completion of chemotherapy, fundus examination of the left eye demonstrated traction retinal detachment involving 80% of the retina with vitreous hemorrhage (Figure 2A). B-scan ultrasonography showed traction retinal detachment attached to the disc with 3.2 mm of subretinal fluid (Figure 2B). Fluorescein angiography demonstrated 360° of retinal ischemia, no view of the choroid, and hypofluorescent tumor with neovascularization elsewhere over the tumor (Figures 2C–2D). There were multifocal areas of neovascularization elsewhere and minimal iris neovascularization superonasally. Intraocular pressures were 18 mm Hg in both eyes. Enucleation or cautious observation was advised. On follow-up examination 2 months later, there was near complete resolution of the vitreous hemorrhage (Figure 2E). B-scan ultrasonography revealed posterior vitreous detachment and shallow traction retinal detachment attached to the optic disc that had settled to 1.1 mm in height with decreased subretinal fluid (Figure 2F). Fluorescein angiography demonstrated reduction in peripheral non-perfusion and complete spontaneous regression of neovascularization elsewhere with observation alone (Figures 2G–2H). Development of posterior vitreous detachment was thought to lead to reabsorption of subretinal fluid with subsequent settling of traction retinal detachment. Spontaneous regression of retinal neovascularization in retinoblastoma following retinal reattachment after intra-arterial chemotherapy (IAC). 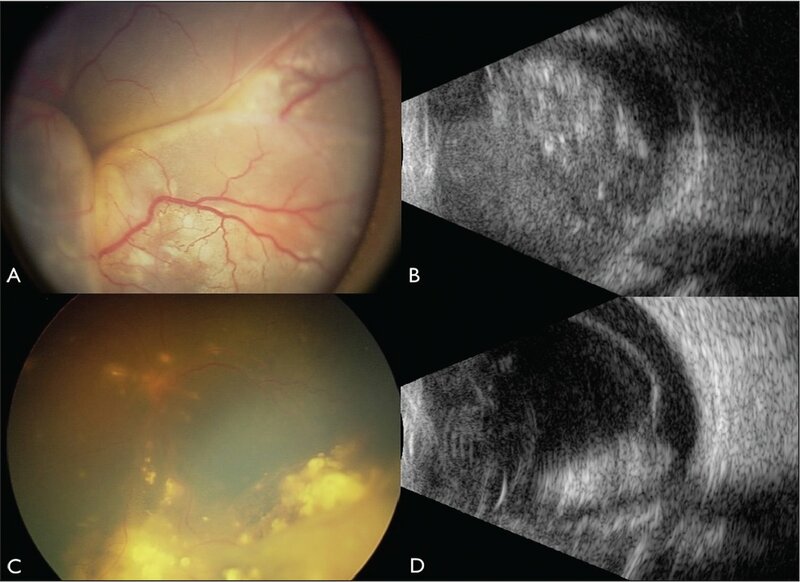 (A) At 4 months after IAC, there was complete tumor regression with vitreous hemorrhage and (B) traction retinal detachment on ultrasonography with 3.2 mm of subretinal fluid. (C, D) Fluorescein angiography (FA) revealed extensive peripheral retinal nonperfusion with retinal neovascularization (arrows). (E) After 2 months of observation alone, vitreous hemorrhage resolved (F) with settling of retinal detachment and decreased subretinal fluid to 1.1 mm in height on ultrasonography. FA confirmed spontaneous restoration of peripheral retinal perfusion with (G, H) regression of neovascularization (arrows). Neovascularization associated with retinoblastoma has most commonly been reported on the iris, with iris neovascularization found on histopathology of 44% to 59% of enucleated eyes.6,7 The mechanism for iris neovascularization is thought to be secondary to VEGF released from hypoxic areas of the tumor due to necrosis or hypoxic retina due to retinal detachment. Frank neovascularization of the retina secondary to retinoblastoma has seldom been reported. In one case, a 14-month-old boy was reported to have retinal neovascularization secondary to retinal ischemia from presumed tumor growth.8 In our patient, the mechanism for retinal neovascularization was retinal ischemia secondary to total retinal detachment and massive tumor at initial presentation. Spontaneous regression of retinal neovascularization is atypical but has been reported in association with other diseases.9,10 There have been several cases of patients with proliferative diabetic retinopathy who experienced spontaneous regression of neovascularization elsewhere and neovascularization of the disc with observation alone.9,10 Typically, poor glycemic control leads to breakdown of the blood–retinal barrier, allowing retinal ischemia to ensue with release of VEGF and subsequent neovascularization. Better glycemic control has been shown to result in repair of the blood–retinal barrier with eventual regression of retinal neovascularization without treatment.9 Interestingly, Bandello et al.9 and Han et al.10 reported cases in which patients did not achieve better metabolic control of their disease, yet still demonstrated spontaneous disappearance of neovascularization elsewhere and/or neovascularization of the disc with no proposed explanation. To our knowledge, spontaneous regression of retinal neovascularization has not been previously reported in cases of retinoblastoma. Although retinal neovascularization is typically treated with anti-VEGF therapy or laser photocoagulation to areas of ischemic retina, our patient demonstrated spontaneous disappearance of neovascularization elsewhere after 2 months of observation alone. We suspect that development of posterior vitreous detachment with reabsorption of subretinal fluid and settling of retinal ischemia related to traction retinal detachment led to a reduction in VEGF production. We report a case of spontaneous regression of florid retinal neovascularization following posterior vitreous detachment and resolution of traction retinal detachment in an eye with treated retinoblastoma. Although further studies are needed to elucidate situations in which observation versus immediate intervention is appropriate, this report highlights the possibility that restoration of retinal perfusion with regression of retinal neovascularization can occur following posterior vitreous detachment and resolution of retinal detachment. Wu AL, Wu WC. Anti-VEGF for ROP and pediatric retinal diseases. Asia Pac J Ophthalmol. 2018;7:145–151. From the Ocular Oncology Service, Wills Eye Hospital, Thomas Jefferson University, Philadelphia, Pennsylvania (KAG, LAD, CLS); and the Department of Ophthalmology, Mayo Clinic, Rochester, Minnesota (LAD). Supported in part by the Eye Tumor Research Foundation, Philadelphia, Pennsylvania (CLS).